The 2020 presidential election race is now in full swing, even though it’s still early in 2019. Presidential races seem to get longer every four years. Now we’re at the point where the next race begins when the votes in the midterm election are barely counted. If you’re a political junkie (I’m not), this is like heaven on Earth because the politics never end. Trump is a shoo-in for the Republican nomination, so not much will happen on the Republican side until the summer of 2020. John Kasich and Jeff Flake may challenge Trump in the Republican primaries. This will provide some hope to “Never Trump” Republicans, but these are not serious challenges and they’ll be lucky to get out of the single digits in primary returns. Things are different on the Democratic side. There may be as many as 20 Dems running for president, a thundering herd. 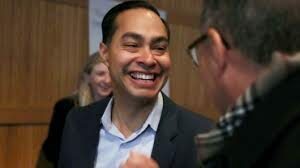 So far, Elizabeth Warren (D-MA), Tulsi Gabbard (D-HI) and Julian Castro (former HUD secretary and subject of this article) have all declared they are running. But you can expect to hear announcements by Joe Biden, Beto O’Rourke, Bernie Sanders and many more in the next few months. This creates an interesting dynamic. Most primaries are “winner take all,” meaning the candidate who gets the most votes takes all of the delegates from that state. With 20 candidates, the average vote will be 5% each. In fact, most candidates will get 1–3% and only a handful will break into double digits. This means that a 20% share of the vote could win 100% of the delegates from each state. To do that you need money, name recognition and voter loyalty. Incredibly, the candidate who would be the strongest in all three categories is Hillary Clinton. Don’t count Hillary out; she may be running again and would start in a strong position. A crowded field gives her a chance to pick up delegates even with minority support. Stranger things have happened.